Time has largely forgotten these other signs. One still rusts away in the chaparral day, toppled and discarded long ago. The Hollywoodland Sign —a mere real-estate advertisement when it rose from the face of Mt. Lee in November 1923, as disposable as the rest—might have suffered a similar fate. But as Hollywood soon became an accepted metonym for L.A.'s glamorous film industry, the sign's letters acquired a new meaning. Nine decades later, it's become one of the city's greatest monuments—a journey richly chronicled by USC cultural historian Leo Braudy. This sign might have predated Hollywoodland's. Angled toward Beverly Hills from the slopes above Benedict Canyon, these giant white letters advertised Beverly Terrace, a 110-acre subdivision that developer George E. Read opened in 1922. 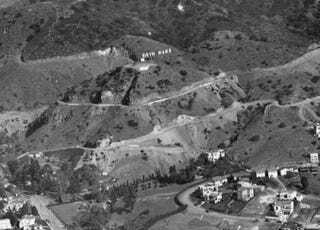 Seemingly a close relative of the Hollywoodland Sign, Beverly Crest's block-letter sign first appeared on the slopes above Coldwater Canyon in December 1923—only one month after Hollywoodland's. Large signs weren't all the two developments had in common; they also both featured elaborate stone gates modeled after fairy-tale castles. In 1911, what was once a small farming community in the rural Eagle Rock Valley north of Los Angeles incorporated as the independent city of Eagle Rock. Did that act occasion the sign (barely) visible atop the San Rafael Hills in this photo from the LAPL's Security Pacific National Bank Collection? Top image: A detail of this 1924 photo, courtesy of the Photo Collection – Los Angeles Public Library.